As much as I love The Walking Dead - and, um, Daryl Dixon - I don't do the scary, gory side of Halloween. But the cute, silly and fun aspect - I can totally get into that. 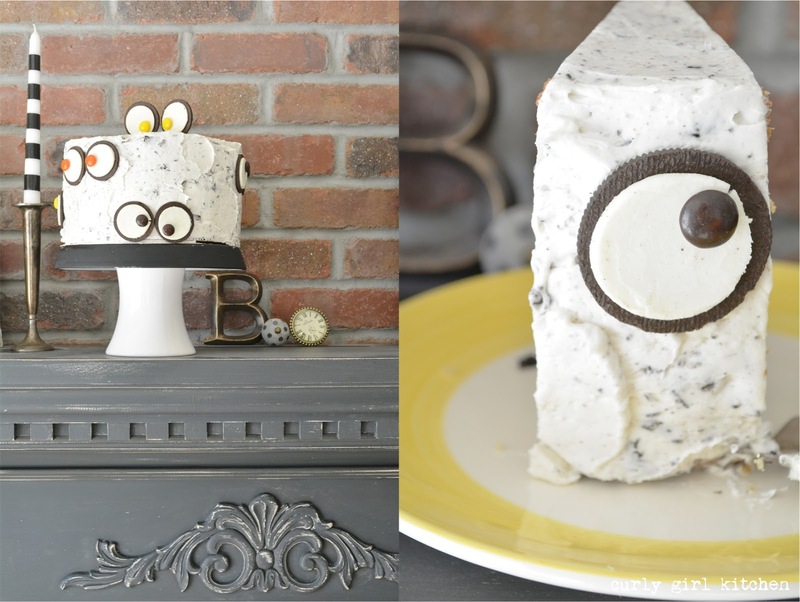 And ever since I saw the monster eye cake on The Cake Blog, I've wanted to recreate my own. 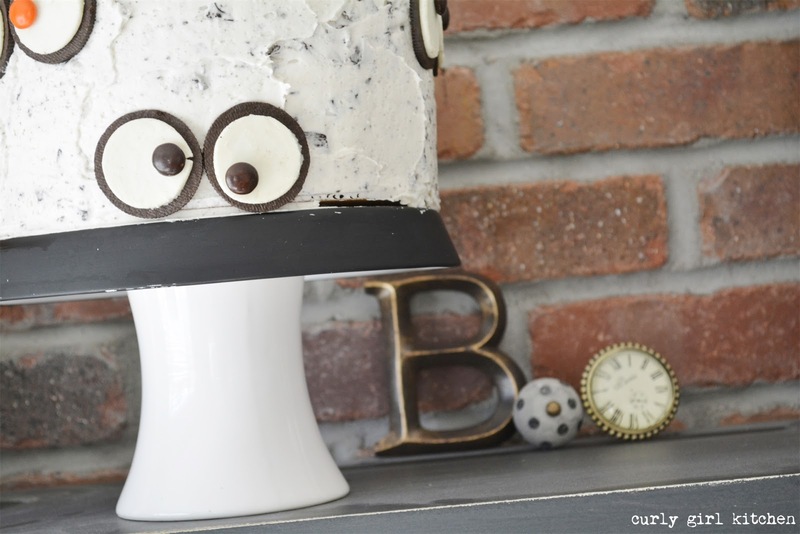 As it happens, I had also been meaning to post a cookies and cream cake - which was always my brother's favorite birthday cake when he was little - and something that I still love. 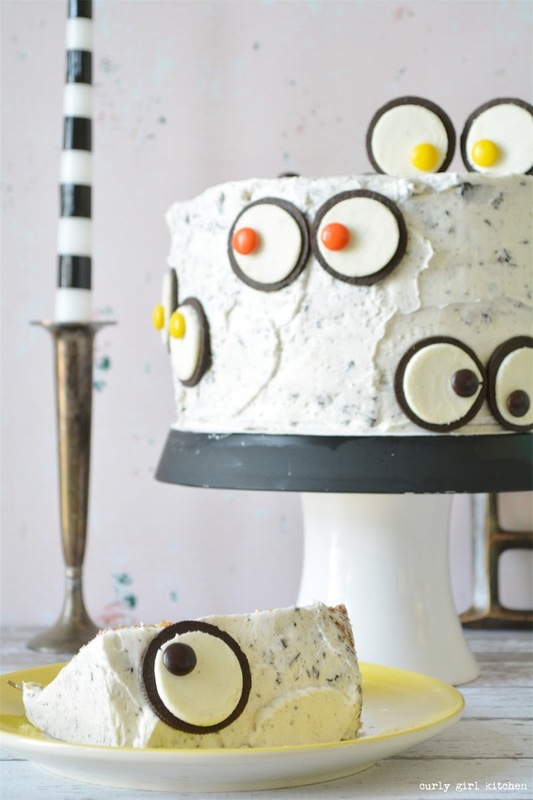 Even though I'm all grown up, I (and I think most people) still have a thing for treats made with their favorite cookies and candies to make them feel like a kid again on their birthday, but without the torture of being forced to clean your plate of mushy, frozen mixed vegetables before you're allowed to have cake. He was such a cutie, with his chubby cheeks and wavy brown hair, wearing his favorite cowboy hat and boots (or sometimes an empty cool-whip container as a hat) to play tether-ball, and begging my sister and I to play something with him other than Barbies. We preferred to pretend he was our live doll, dress him up in baby clothes and curl his hair. You can make the cake itself vanilla or chocolate - I went with vanilla - with half a package of crumbled Oreos mixed into the batter before baking. Had I bought an extra package of Oreos, I probably would have added more cookies to the batter so that every single bite contained bits of cookies. The rest of the cookies are twisted apart and the frosted side used for the monster eyes with the unfrosted side crumbled and mixed into the buttercream. 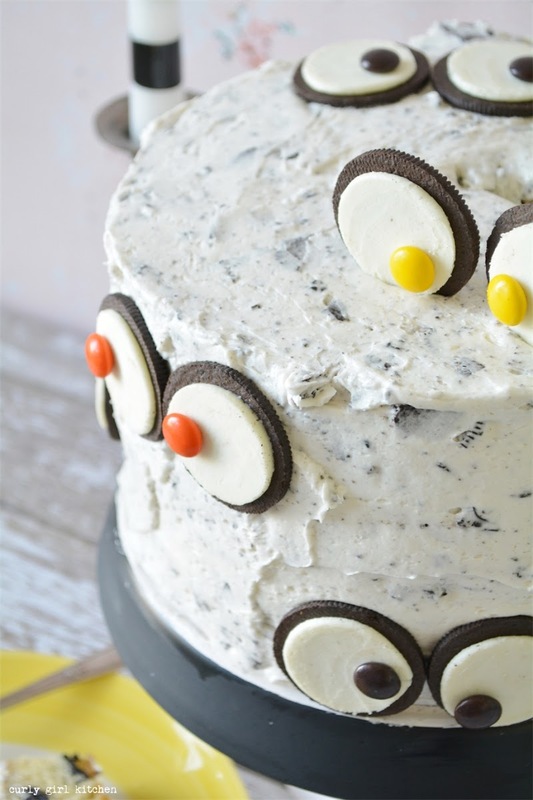 The salt in the buttercream is important - with all the cookies and candy this cake can lean a little towards being too sweet, and the salt helps to balance the sugar, as well as adds a sophisticated flavor. 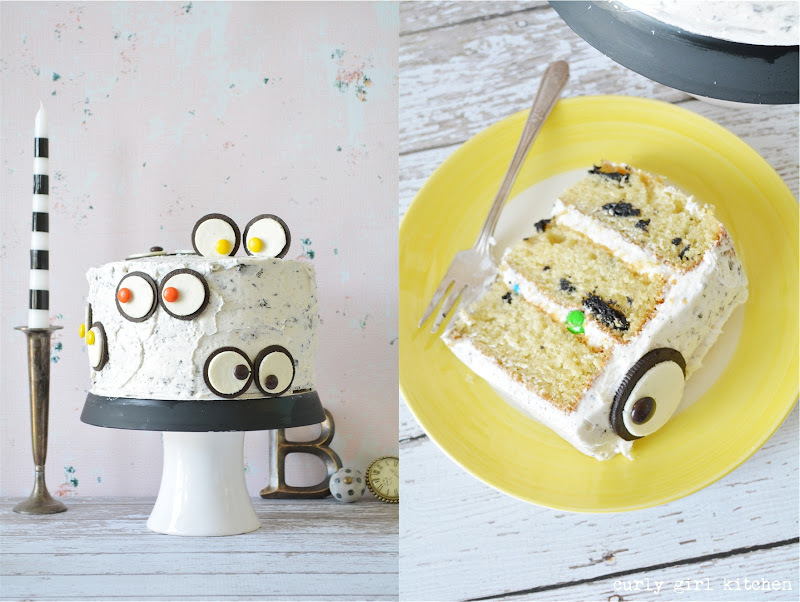 You can make your eyes with any color M&M pressed against the frosting. I thought the yellow, orange and brown was so festive (and also, the little package of M&Ms I bought hardly had any brown). 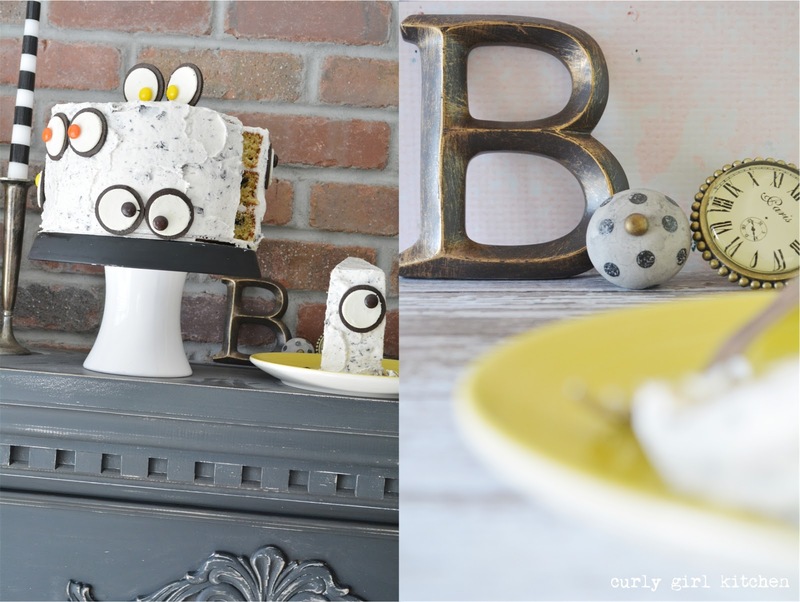 And because I didn't want an open package of M&Ms tempting me to eat them for breakfast as I was frosting the cake Sunday morning before the photo shoot, I sprinkled them between each layer for extra crunch and texture. Which just made it taste even better. Preheat the oven to 350 and grease three 8-inch pans. In a large bowl, whisk together the dry ingredients. Add the wet ingredients and beat until well combined. Fold in the Oreos. Divide the batter between the pans and bake for 20-25 minutes, until a toothpick comes out clean. Set pans on wire racks, cover loosely with clean kitchen towel and cool completely. In the bowl of your stand mixer fitted with the whisk attachment, beat the butter for one minute until smooth. With the mixer on low, gradually add the powdered sugar, meringue powder and salt and mix to combine. Add the vanilla and milk/cream and whip on medium high for 4-5 minutes until light and fluffy. Fill the cake layers and frost all over with a thin crumb coat of buttercream (I also sprinkled the extra M&Ms between each layer for crunch). Refrigerate for 20 minutes. 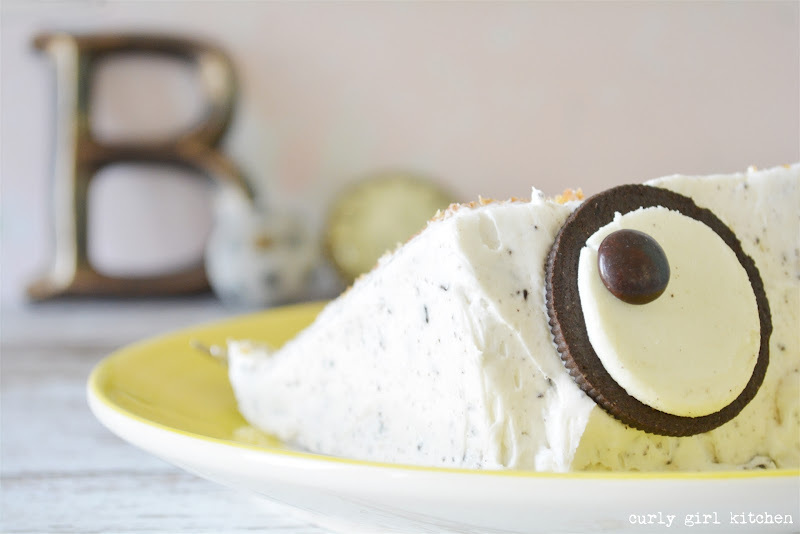 Meanwhile, carefully twist apart the Oreos and set aside the frosted side for the eyes. Roughly chop the unfrosted sides and fold into the remaining buttercream (don't over-mix, or the crumbs will turn the frosting gray). 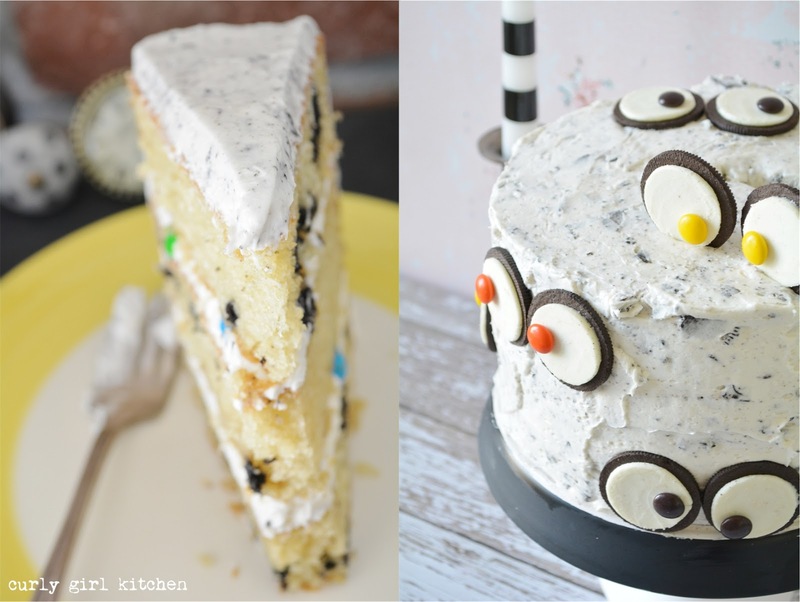 Frost the cake with the Oreo buttercream. 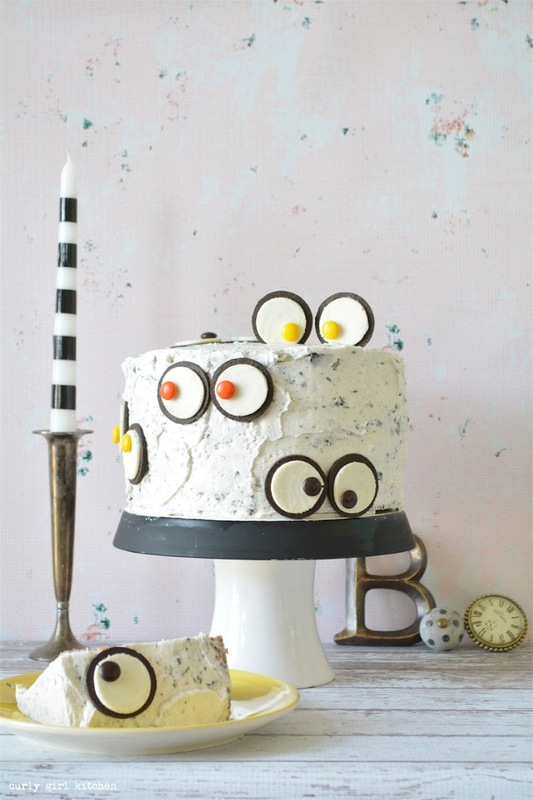 Press M&Ms to the frosted cookies and stick onto the cake for the monster eyes. 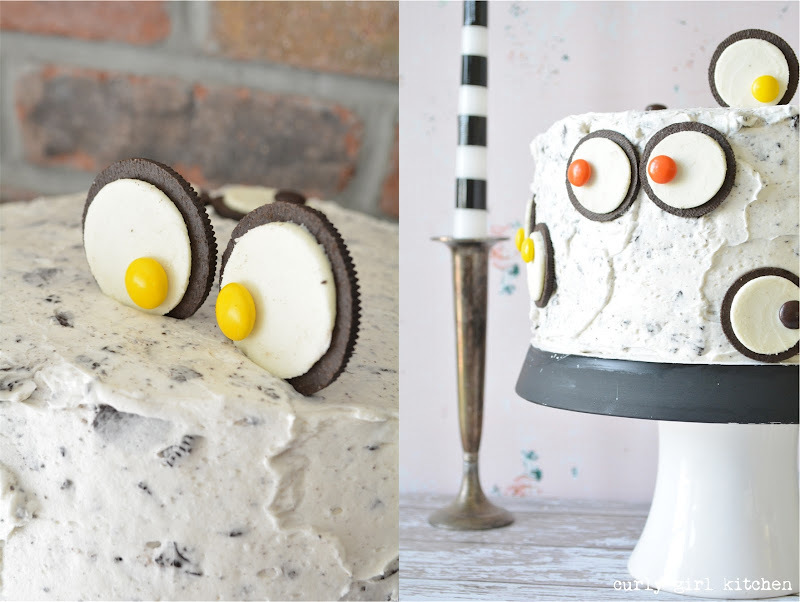 Baker's Note: The reason I wait to add the Oreos to the buttercream until after doing the crumb coat is that they would make it very difficult to get a smooth crumb coat on the cake with all the cookies mixed throughout. Booteous Heather! 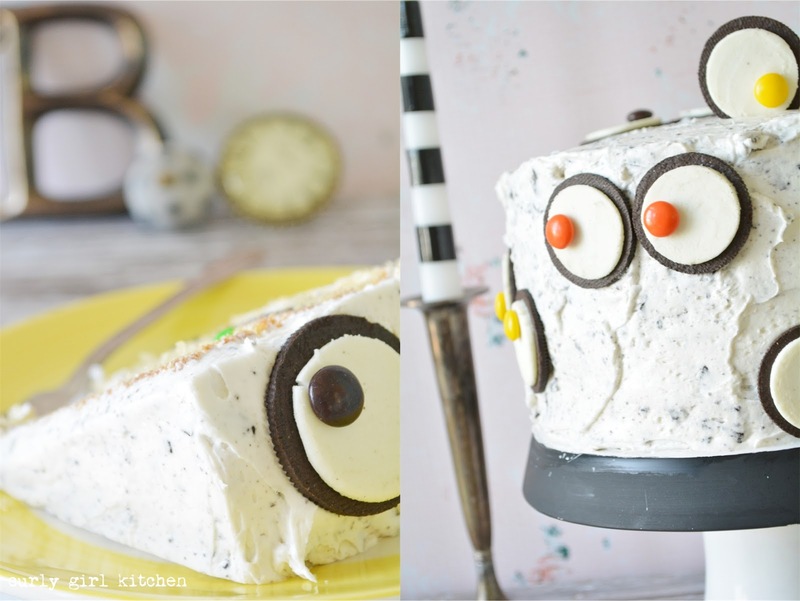 Now that's a cute cake and I bet it's delicious. It's a fun little trick, isn't it? I agree, although not without milk!